In Chronoschisms Ursula Heise explores the way developments in communication and information technology have led to the emergence of a new culture of time in Western societies. 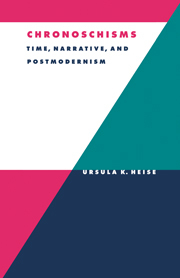 Drawing on theories of postmodernism and narratology, she shows how postmodern narratives break up the concept of plot into a spectrum of contradictory story lines that allow new conceptions of history and posthistory to emerge. This wide-ranging study offers new readings of postmodernist theory and fresh insight into the often vexing relationship between literature and science. Introduction; Part I. Chronoschisms: 1. From soft clocks to hardware: narrative and the postmodern experience of time; Part II. Time Forks and Time Loops: 2. Number, chance and narrative: Julio Cortázar's Rayuela; 3. 'Repetitions, contradictions and omissions': Robbe-Grillet's Topologie d'une cité fantôme; 4. Print time: text and duration in Beckett's How It Is; Part III. Posthistories: 5. ∆t: time's assembly in Gravity's Rainbow; 6. Effect predicts cause: Brooke-Rose's Out; Epilogue: Schismatrix; Bibliography.